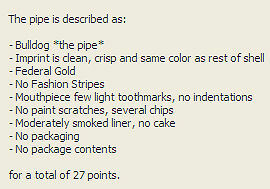 The value of pipe #300 is 27 points. Thelma and Paul Dover had an auction on eBay for five pipes separately. They were all but one potential additions to the collection, so I bid on four of them. They identified one of them as "light tan" in color but it turned out to be the older shade of Federal Gold. The Horizon Blue Pot and Ash Grey Apple have joined the collection and the Burnt Orange Billiard went directly to the Pipes for Sale page. An un-smoked example of this shape/color with the original price sticker on the mouthpieces came my way so this one now joins the Pipe for Sale or Trade page. Dr. Herbert M. Burks took a liking to this one and got it to smoke.